The breast screening program offers screening mammography (breast X-ray) to women aged 50-74 years at three sites in province (St. John’s, Gander and Corner Brook). The program also offers education sessions on breast health and breast navigation services from abnormal mammogram results to further follow-up. Participation in breast screening is a personal decision and it is important to discuss the benefits and harms of screening with your health-care provider so that you can make an informed decision about what is best for you. The main benefit of breast screening is the early detection of breast cancer, which may reduce the risk of dying from breast cancer. Detecting cancer at an early stage may allow a simpler treatment pathway for women diagnosed with cancer. Over-diagnosis – Not all breast cancers will cause harm. With screening, some women will be diagnosed with a cancer that would not lead to a long-term a health problem; this is called ‘over-diagnosis’ and leads to unnecessary treatment. 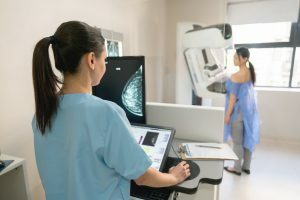 False positives – A false positive test occurs when a person tests positive (abnormal mammography) but ultimately, following further testing, is determined not to have cancer. A false positive can lead to additional testing, including biopsy, and may cause psychological and physical harm. Eastern Health follows the Canadian Task Force Preventive Health Care (CTFPHC) guidelines, which state that the benefits of mammography screening increases with age, and they recommend not screening women under 50 but to screen women over 50 to age 74 every two-three years. If you decide to participate in breast cancer screening, please contact a breast screening program near you to book an appointment. Note that at least 80 per cent of women with breast cancer have no family history of breast cancer. Breast cancer starts when cells in the breast begin to grow out of control. These cells usually form a tumor that can often be seen on an X-ray or felt as a lump. The tumor is malignant (cancerous) if the cells can grow into (invade) surrounding tissues or spread (metastasize) to distant areas of the body. Breast cancer occurs almost entirely in women, but men can get it as well. Not all tumors or lumps are breast cancer. For more information please see ‘What is breast cancer?’ from the Canadian Cancer Society. Women between the ages of 50-74 may self-refer to breast screening. Should I undergo breast screening? Are mammograms safe? Do they hurt? How can I be part of the breast screening program for Newfoundland and Labrador? Are abnormal screening results common? 1. What is a screening mammogram? A screening mammogram is a breast X-ray for women who have no breast problems. 2. Should I undergo breast screening? The breast screening program recommends screening mammograms for that women aged 50-74. Women under 50 and over the age of 74 are advised to check with their health-care provider. Participation in breast screening is a personal decision and it is important to discuss the benefits and harms of screening with your health-care provider so that you can make an informed decision about what is best for you. For more information, please see the breast cancer screening guidelines by the Canadian Task Force Preventative Health Care (CTFPHC). had a mammogram less than one year ago. 3. Why should I have a mammogram? The main benefit of breast screening is the early detection of breast cancer, which may reduce the risk of dying from breast cancer. A screening mammogram has the ability to detect changes years before they can be felt. It is the best tool we have for early detection. 4. Are mammograms safe? Do they hurt? Current mammography equipment uses very low doses of radiation. The benefits of screening for breast cancer far outweigh any risk of harm from the X-ray. To get a clear picture, the breast is compressed between two plates. A mammography technologist will position your breast carefully and take two views, one from the side and one from the top of the breast. This may feel uncomfortable for a few seconds. No, a doctor’s referral is not required. At the Breast Screening Program for Newfoundland and Labrador you can book your own appointment if you are between 50 and 74 years of age. This service is free of charge and please remember to bring your MCP when you come to your screening appointment. 6. How can I be part of the breast screening program for Newfoundland and Labrador? Call the Breast Screening Centre nearest you to book an appointment. Your health-care provider can refer you to participate. Once you are enrolled in the Breast Screening Program, re-screening appointments are coordinated by the Program. 7. When will I get my results? Your mammogram will be read by a radiologist with training in interpreting mammography. The Breast Screening Program will send you and your health-care provider a letter with the results of your mammogram within seven to 10 days after your appointment. About 5-10 women out of 100 will need more tests after their screening mammogram. Your letter will inform you of the date and time of the recommended test(s). Your health-care provider and the screening program are available to answer any questions you may have on your screening results. After these follow-up tests, most women will have a normal result and should return to the program for screening in one or two years as recommended. 8. How effective is mammography? Mammograms are the best way to identify breast cancer early. Screening mammograms can identify approximately 85 per cent of breast cancers. Many studies show that regular mammograms reduce the risk of dying from breast cancer. For more information, please see the Breast Cancer Surveillance Consortium. 9. Are abnormal screening results common? About 5-10 women out of 100 will need more tests after their screening mammogram. After these follow-up tests, most women will have a normal result. 10. How do I prepare for a mammogram? On the day of your mammogram, do not wear deodorant, body powder or perfumes. These may contain small metal particles that can interfere with the quality of the mammogram. You can take your deodorant in your purse and apply it after the exam. It is helpful if you wear comfortable clothing, possibly a skirt or pants that will allow you to undress from the waist up. The technologist welcomes any questions related to the mammogram.